The average number of visitors dining at these 11 shopping centers is rather significant, comprising both Thai and foreign clients, including those from the surrounding provinces. For these clients, Thai food has become rather influential in their dining decision. Boasting a balanced flavor profile, vibrant colors, meticulous preparation and quality ingredients, Thai cuisine has captivated the heart of not only Thai people but also visitors to the Kingdom. The Amazing Thai Taste menu is comprised of six items, namely massaman, tom yum kung (spicy and sour soup with shrimp), som tum (Thai papaya salad), pad thai, tom kha gai (Thai sour coconut soup with chicken) and green curry. To complement this main menu, there are also all-time-favorite pad kaproa (a spicy stir-fry of the meat of your choice with holy basil), seasonal fruits such as mango, coconut and durian, and Thai desserts such as mango or durian with sticky rice. 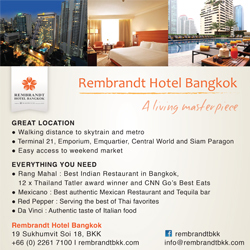 Receive 100 baht back on your card for every 1,000 baht / sales slip** spent in the restaurant category. MasterCard holders receive a free baht-coin coaster for every 1,500 baht spent in the restaurant category while regular customers receive the same item for every 2,000 baht spent at one of the following four shopping centers: CentralWorld, CentralFestival Chiang Mai, CentralFestival Phuket and CentralFestival Samui.